BSJ | Silence, Speechlessness, and Freedom in Nathaniel Hawthorne’s The Scarlet Letter. 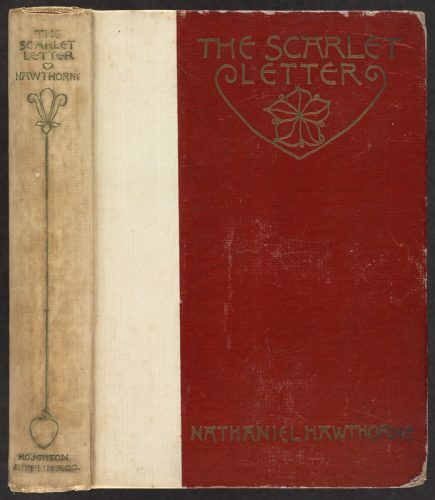 Nathaniel Hawthorne’s The Scarlet Letter (1850) is a portrait of life in 17th Century Puritan New England. This follows Hester Prynne, who has borne a child through an affair, and explores her struggle to find peace and freedom despite the hardships she faces as a result of Puritan law and expectations. ‘Silence and speechlessness’ is intrinsically linked to constraints placed upon inhabitants of New England. Conversely, deliberate silences, choices of speech and other forms of expression are associated with being outside the geographical and social boundaries of the Puritan town, and are used by Hawthorne to explore the possibility of freedom. Hawthorne’s novel investigates a culture-nature divide associated with silence and speechlessness through behaviours of characters within the different environments. The authoritative nature of adult speech in The Scarlet Letter is countered by Pearl who ‘was born outcast’ in a setting made up of ‘a people amongst whom religion and law were almost identical’. Pearl’s existence as a child of adultery both defies the religious and legal ruling, subsequently Pearl’s outsider identity as having ‘no rights among Christian infants’ means she was in a sense born free from the pressures faced by others trapped within the boundaries of Puritan social decorum. Pearl’s otherness and light-hearted nature is exemplified as ‘she laughed, and went capering down the hall so airily, that old Mr Wilson raised a question whether even her tiptoes touched the floor […] ‘‘The little baggage hath witchcraft in her, I profess!’’. Pearl’s delicate footsteps are contrast the boldness of Mr Wilson’s speech. This reinforces the existing tension between suspicious Puritan culture of closely intertwined law and religion, and the unknown or mystical nature of the ‘new world’ inhabitants of New England were surrounded by. The world of The Scarlet Letter focuses on ‘the realm of culture’ of Puritan society, but is intercepted by the ‘wild, free atmosphere of an unredeemed, uncharmed, lawless region’ which is embodied by the lawless, feminine, ‘imp’ figure of Pearl. Dimmesdale’s language manipulation to speak the truth whilst staying silent about his secret is representative of the character being silenced by fear of persecution by the society that revers him. It can alternatively be interpreted that Dimmesdale’s self-inflicted torture via repression of speech is an act of repentance for his past sins. Hawthorne writes ‘It is inconceivable, the agony with which this public veneration tortured him!’ The feeling of guilt that arises in Dimmesdale as a result of the contrast between his sense of self and the way others view him, due to the half-truths revealed to the townspeople through his speech, is a source of self-punishment. This kind of behaviour is symptomatic of the Puritan focus on honesty. Sally Promey highlights that prominent New England Puritan minister Cotton Mather wrote “Frequent SELF-EXAMINATION, is the duty and the prudence, of all that would know themselves”. Dimmesdale’s silence results in torturous reminders that, whilst being the father of a ‘sin-born child’, he is praised by the townspeople as a ‘mouthpiece of Heaven’s messages of wisdom, and rebuke, and love.’ In contrast to Hester Prynne, whose silence is symbolic of loyalty to Dimmesdale, Dimmesdale’s own silence is a symbol of falseness to others and mercilessness to himself. The conflictions of self and silence is an issue that Pearl, blissfully unaware of her ‘sinful’ birth, does not suffer from. Pearl’s lack of internal suffering from social pressure allows the figure to retrieve knowledge from others’ silence. The ‘mischief gleaming in her black eyes’ gives Pearl access to another way of communicating. Contrastingly to her repressed parents, Pearl’s guiltlessness means her speech is employed unreservedly and honestly. She exclaims of the ‘A’ on Hester’s chest ‘it is for the same reason that the minister keeps his hand over his heart!’. Pearl’s ‘bright’ and ‘magnetic’ stare suggests that her eyes are her tool of knowledge as opposed to having to employ speech or human conversation of the other Puritans to retrieve information. The assertion of Pearl having ‘witchcraft in her’; or some kind of freedom of superior knowledge, separate from the Puritan cultural norms, suggests that having been borne of the will of the devil, the character embodies heightened sensitivity to the secrets of ‘The great black forest’. This is not only the forest that forms part of the physical setting of the novel, but also mental space of freedom away from Puritan Rule where the secrets of her parents’ speechlessness can be revealed. The forest as a place of freedom from Puritan society is explored in Hester’s speech within the spheres of the forest as opposed to within the Puritan landscape. Hester’s first word in the novel is the exclamation ‘Never!’ as she refuses to publicly reveal the identity of Pearl’s father. The forest space outside of Puritan control frees the character from silence as Hester defiantly ‘undid the clasp that fastened the scarlet letter threw it to a distance among the withered leaves [and] heaved a long, deep sigh, in which a burden of shame and anguish departed from her spirit.’ Allan Gardner Lloyd Smith’s identification of ‘The intertwining of natural and institutional law, proposed as reciprocal supplements of one another’ within The Scarlet Letter is highlighted in Hester’s change of action and speech. The forest empowers Hester and by the act of undoing the ‘clasp’ of the scarlet letter, Hester releases herself from the institutional clasp of the Puritan rules she was entrapped by. ‘The deep sigh’ of relief- a release of breath using Hester’s mouth piece that she would use for speech- suggests that the laws of nature allow for her forgiveness and freedom from speechlessness that the Puritan society refuses to permit. The removal of ‘a burden of shame and anguish’ establishes Hester as in that moment being at childlike peace just as her daughter, who is attune with the nature of the forest rather than concerned with the cultural rulings of New England. In reading The Scarlet letter in 2018, over one-hundred years after its original publication, the portrayal of speech and silence in relation to the nature-culture conflict of the novel continues to be relevant. Hawthorne’s text is a stark portrayal of the repressive authoritarian Puritan society and the internal conflict of those entrapped within it. Hawthorne’s exploration of restrictive social attitudes suggests adaptation of social and cultural expectations is essential to individual freedom and happiness in whatever context a person inhabits. Nathaniel Hawthorne, The Scarlet Letter (Oxford: Oxford World Classics, 2008), p.74. Cindy Weinstein, ‘Introduction’, in Nathaniel Hawthorne, The Scarlet Letter (Oxford: Oxford World Classics, 2008), p.ix. Sally M. Promey, ‘Seeing the self “in frame”: early new england material practice and puritan piety’, Material Religion, 1/1 (2005), p.16. Allan Gardner Lloyd Smith, ‘Chapter One: The Elaborated Sign of The Scarlet Letter’, Eve Tempted: Writing and Sexuality in Hawthorne’s Fiction (Kent: Croom Helm, 1984), p.20.